R A Brown Engineers Charlie Bartram, Jordan Read and Luke Brooks are doing a charity skydive on 29th September at Beccles skydiving centre in aid of The Charity Heart 2 Heart. The reason behind the Engineers supporting this charity is that Richard Brown collapsed after suffering a heart attack in June. Richard had stopped breathing and had literally ‘died’ as he was leaving Gorleston Sailing Club. 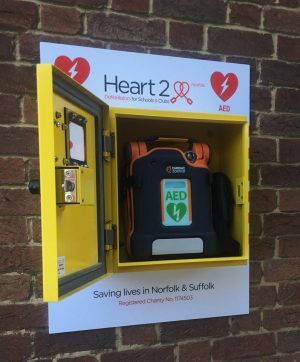 He only survived because he was within 10ft of a defibrillator which was situated close to the Pier Hotel in Gorleston. Richard was fortunate to be near the life-saving equipment which had been placed by Heart2Heart, club members had been trained to use it and knew the access code, unlocking precious seconds, which literally saved his life. Heart 2 Heart had completed a training day with the sailing club members last year, which meant that the sailing club members were able to respond quickly with the help of the skills of the 3 people who helped Richard and the defibrillator, Richard wouldn’t be here today.